Beverly Alberts has always felt elevated by the beauty of the creative arts. She is a familiar face at musical performances, plays, opera broadcasts, museum openings, and lectures on the arts and humanities, which greater Brattleboro offers in abundance. In the early '80s, she had also become a fan of the area's many fine artists. With just one dedicated gallery in town, however, she decided to extend their marketing outreach by serving as an artist's representative further afield in New England in 1981-84, an effort cut short by a bout with breast cancer. Beverly's devotion to promoting local artists had been noted by George Becker, who invited her to help plan creation of the Windham Art Gallery (WAG) in 1989. Beverly coordinated the volunteer sitters and spent many a turn on the sitter schedule herself. 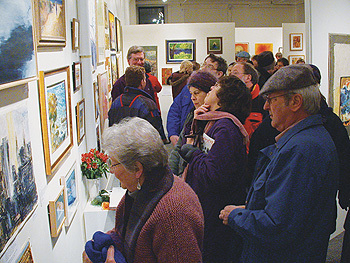 The Arts Council of Windham County was closely allied with WAG and shared its eventual space on Main Street for the bulk of the gallery's 20-year run through 2009. Beverly had worked with Marie Procter in that collaborative space to establish Student Art Month. Fittingly, when the Council dreamed up the first Friend of the Arts Award, it was bestowed on Beverly Alberts. Beverly's close relationship with the region's community of creative artists helped in her responsibilities as curator for shows at Brooks Memorial Library from 2000 to 2002, and was a great boon to her work co-leading the Arts Committee at All Souls Church in West Brattleboro from 2002 to 2012. She selected artists for most of the exhibits at the church, oversaw show hangings, and helped run opening receptions. She is still a committee member and frequently a reception co-host. Over the years, Beverly has also been an avid art collector, whether making a direct purchase of original work or an archival print from the artist, or the winning bidder of something offered at any number of art auctions to benefit several of the area's good causes. Now the story of the gradually accumulated "Beverly Alberts Collection" has come full circle. A couple of months ago, Beverly decided to downsize her life, leaving an expansive apartment to "retire" to a space only 16 by 16 at Bradley House. Her walls are still filled with many favorite pieces she couldn't part with, but after sending a number of the collection off with family members and close friends, there were still over 50 works of art to donate to her spiritual home, All Souls Church. Beverly's intent with this special gift is to help the church raise funds for upkeep of the building and grounds -- its heating oil supply and cost of maintaining a famously steep and long driveway, in particular, were big expenses over the past two difficult winters, so any extra support is very welcome, indeed! Currently hanging in the church's gallery spaces, the Beverly Alberts Collection includes works by Maisie Crowther, Carolyn DiNicola Fawley, Gennaro Prozzo, Petria Mitchell, Susan McDormand, Karen Becker, Simi Berman, Dorothy Kehaya, Bob George, Trudy Crites, Gib Taylor, Brian Cohen, and Linda Wright, among others. The exhibit includes photographs, prints, and paintings in a variety of mediums, and a few artful posters. The minimum bids for a Silent Auction of 47 pieces in the collection, many professionally framed, are quite reasonable, most under a hundred dollars, many under fifty. Six larger pieces -- by artists Jeanne Carbonetti, Arrin Fancher, Bill Hunt, Eric Slayton, and Sally Warren, as well as a 4-panel Chinese screen -- will be sold by live auction. Everything must go to a new home! from 4:00 to 6:30 p.m. on Sunday, June 14. A few interludes of live music will punctuate the event. Beverly is looking forward to enjoying a reunion with as many Windham Art Gallery members and other artist friends and fellow art lovers from all over the area as are able to attend. For food and drink planning purposes, it would be great to have RSVPs. Send a quick email to office@ascvt.org or call the church office at (802) 254-9377. The All Souls gallery is otherwise open on Tuesday, Wednesday, and Thursday from 9:00 to 2:00. All Souls Church UU is located at 29 South St. across from the West Brattleboro village green and fire station. Follow the wooded driveway up to a large parking area by the building.